TSK. TSK. 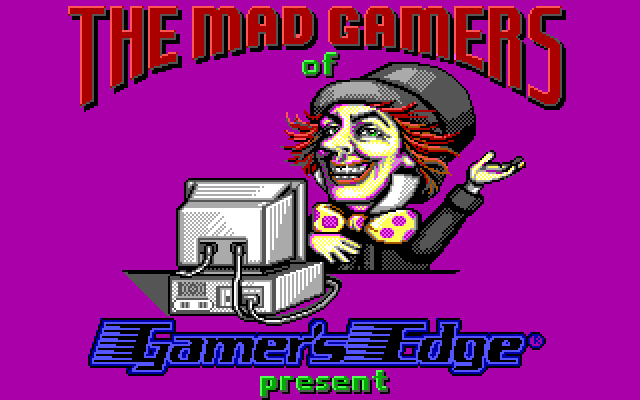 Ripping off John Tenniel's illustration of the Mad Hatter (external link) gets you nowhere. 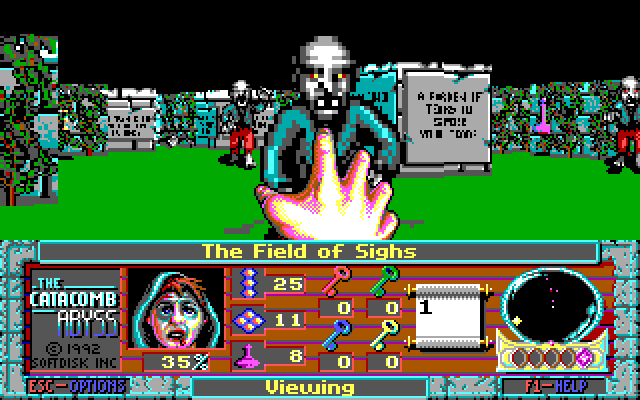 According to the readme, The Catacomb 3-D Adventure games are "graphics intensive" by design, meaning that you are in for a true visual feast once you begin play. Are you ready? 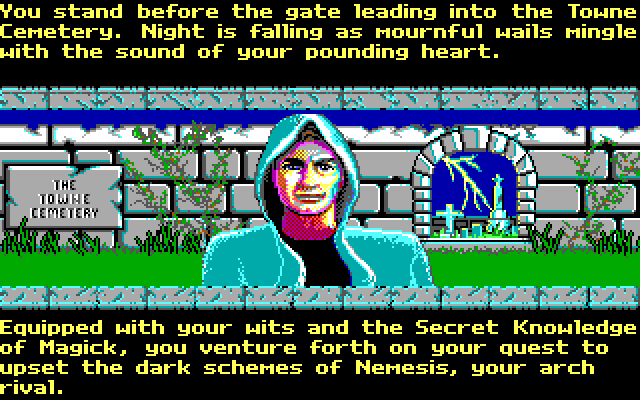 They also go into great length about how useful and awesome being able to save and restore your game at any time is. Can't argue with that; I missed it in Mace. Wouldn't have gotten anywhere in Killing Time without it. Dare I challenge the great Nemesis as a Novice or as a Warrior? That's a difficult question. If you think about it, I'd stand a better chance as a Warrior than as a Novice. Why am I thinking about this so much? 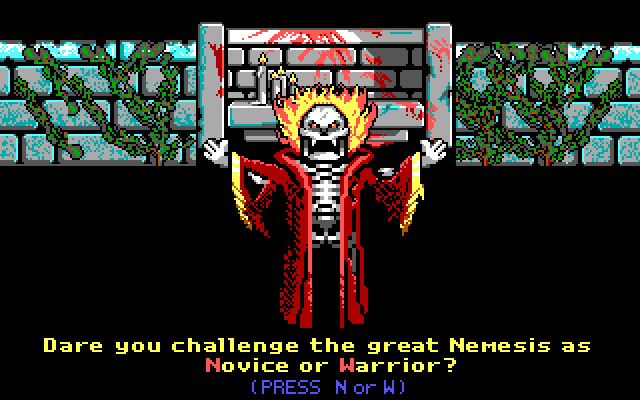 According to the readme, I've already defeated Nemesis once before and he's right in front of me again now! 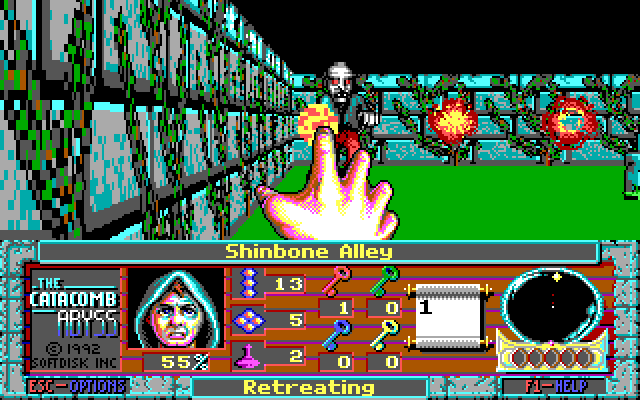 I should be able to blast him to pieces with my magic palms. If I pick 'Novice' he says 'Hah! Another NOVICE to feed my pets!'. I would have been fine with that. I'm great with animals! Are you ready for some epic fantasy RPG action? Tough, it's a Wolfenstein-'em-up. It is FPS Friday, after all. It uses licensed id Wolfenstein tech so we're knee deep in the unshaded, textured walls and block-based maps. Yeargh! Zombies, every time I turn around, Zombies! I've got one weapon, fireballs Magick Missiles, and I'm not afraid to go all out. Every time I try to take a screenshot of an item or a landmark, I'm attacked from behind by zombies that were NOT there before. These zombies seem to take over five fireballs Magick Missiles before they fall. Thankfully, the Wizarde-Warrior-Weaver is a true master of the arcane artes. He doesn't rely on some finite supply of mana or any such petty nonsense: he fires Missiles as fast as you can hammer the CTRL button and never runs out. And you better be able to hammer that CTRL button mighty fast because next to every single item is a zombie waiting to reveal itself. Inside the chest were some single use magic Magick items: the blobs-in-a-line are Zappers, which make the Wizarde fire Missiles in a continuous stream ('like a machine gun' according to the manual) for a few seconds. The blobs-in-a-diamond are eXterminators, which fire Missiles in all directions. The purple potions are Cure potions, which fully heal you. Yum. It's a good job they give you those single use enhanced combat powers because your CTRL finger is going to be very, very tired. Most of the items you need to advance are hidden behind destroyable walls. In this shot, I've found and destroyed a destroyable wall that was identical to those either side of it. A lot of the time, destroyable walls look different to the regular walls, but in this first level they usually look like ordinary windows. Sometimes they look like walls without vines on, as well. You've got no choice but to fire constantly at every surface, hoping to reveal the next place you're supposed to go. Which is a shame, because everybody likes a good secret, but you can't have secrets when you have to motonously blast every wall. Accidentally destroying the bloody powerups with your constant Magick Missile spray. Those two fireballs flying off to the right blew up a Cure potion and a something else. These zombies are very fast and love to side step. When they're not popping out of the ground in front of you, they're popping out of the ground behind you. They don't make any noise, so the only way of telling if they're behind you is the 'Damaging blows!' caption at the bottom of the screen. I've found a purple gem by this point, so I can see the zombies on the radar. It's still very difficult to react using these cursor key controls. 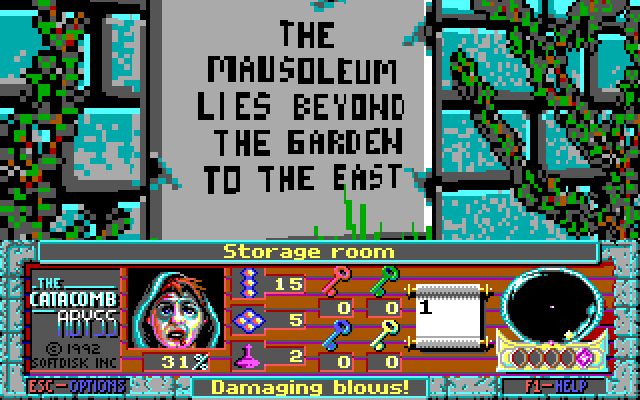 The Garden of Tears is the only place I've found which isn't full of zombies. In fact, this courtyard area where you start is full of powerups and Cure potions. I've taken a second to look through the audio options. At the moment, I've got the default PC Speaker audio enabled, which produced ear-splittingly loud beeps and whoops, as you'd expect. The alternative is Adlib audio, which makes most sound effects sound like somebody's rusting a crisp packet in your ear. The Adlib version of the footsteps and and powerups are much improved. They sound like old Midway cabinet sounds. Take one step beyond and it's zombie combat all over again. The only fear that this Garden is exposing is my fear that all the levels in the game will look exactly the same and I'll have to keep playing until I can find one which doesn't. The lack of shading on the walls makes it quite difficult to gauge depth. 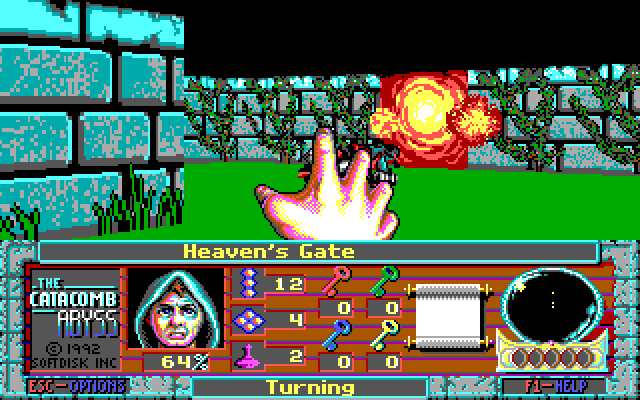 The caption on the interface is the only clue you have as to where you are in the level, but you have to be paying attention otherwise you'll have no idea how 'The twisting hedges' connects to 'Heaven's Gate'. Some places don't have a caption at all. Would it have killed them to make the radar show a map of some kind? This place is called the Field of Sighs. As in: '*sigh* More zombies.' or '*sigh* Damaging blows!' or '*sigh* Accidentally exploded a potion.' or '*sigh* I'm lost.' or '*sigh* I need to find the Red Key' or '*sigh* Gotta keep shooting the walls so I can find the hidden room with the Red Key in it'. 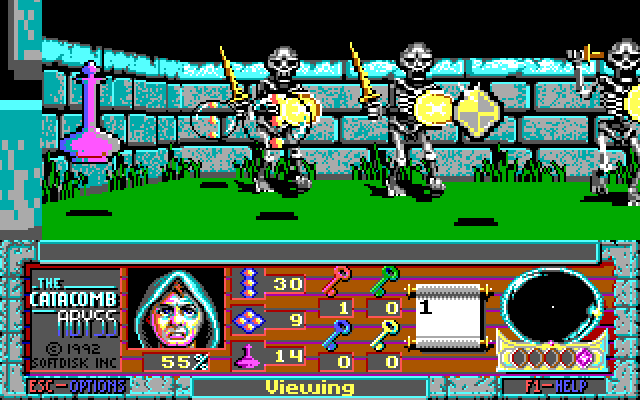 These skeleton warriors are trapped behind a wall of powerups. If I collect or destroy them, they can come out. I decided to collect the Cure potion first and sidestep across to pick them all up (you seem to sidestep twice as fast as moving forwards). 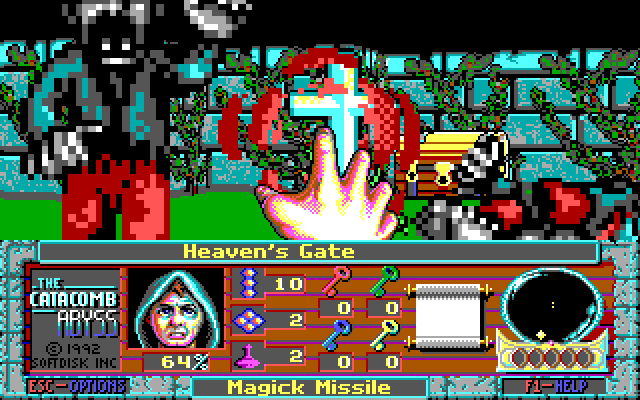 After that, I let them eat a stream of Magick Missiles from the Zapper items I've barely touched. The rapid-fire Missiles weren't even a different colour, which is a bit of a swizz. There's also ghosts and bats here. Very exciting! They both disappear completely when they die, so you're never sure if you've killed them or if they're hiding. I can only see zombies on the radar, so I've got lots more 'Damaging blows!' alerts to look forward to. I've finally reached somewhere which looks different! Time to take a break. This game was fun enough, if a bit easy. It really could have done without those zombies popping up out of the ground everywhere constantly. Not that it made the game that difficult; hitting an enemy with a Missile seems to stun it, so if you can time your CTRL presses so that you're firing fast enough to stun the enemy yet slow enough for the game to register them as distinct blasts, you'll take very little damage. You can see in the screenshot I've got 16 extra lives. I guess I'd need them if I continued on, but so far I've used about two. Only having the one type of attack is a bit lame. Something that lets me hold down CTRL rather than tapping it constantly would be a great help. 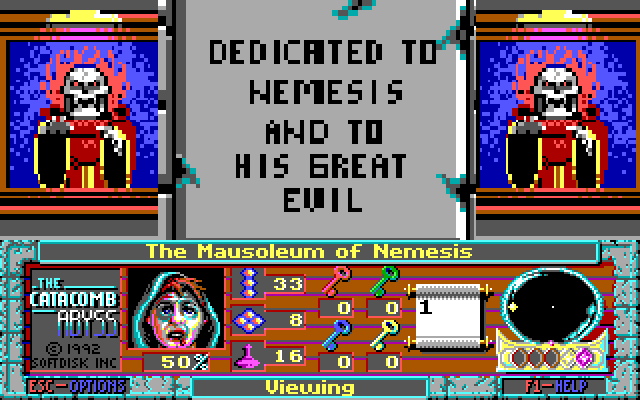 Today's FPS Friday is dedicated to Nemesis and to his great evil. 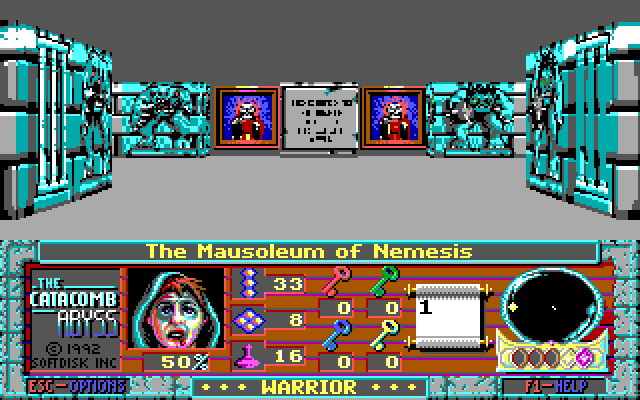 Only kidding, Nemesis is rubbish. Click to see a super secret endingy picture that looks cool which I found in the readme. 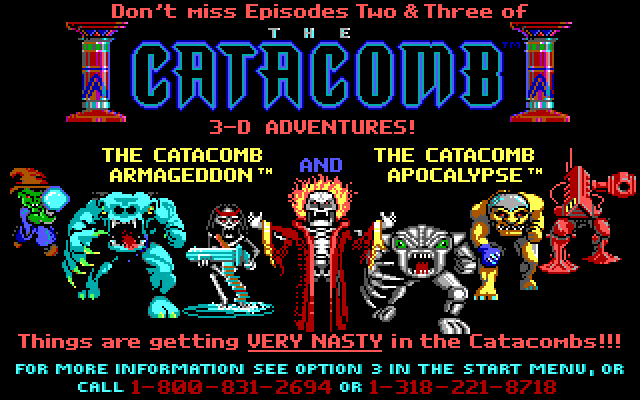 Not coming soon on Super Adventures in Gaming: Episodes Two & Three of The Catacomb 3-D Adventures! WAIT! What's Nemesis doing there? Damn it! If he's in Episodes Two and Three of The Catacomb Abyss, that means you don't get to kill him in this one! Argh! When are these games set, anyway? The manual compared my Zapper to a machine gun, and now we've got a machine gun turret to the left and that robot on the far right. 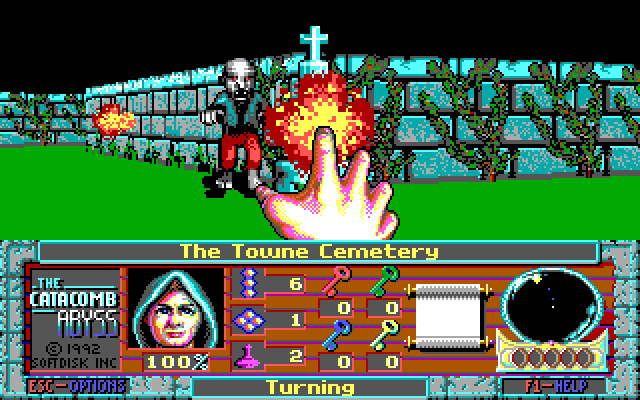 I suppose when you can fire fireballs Magick Missiles from your hands, you don't need firearms. This is getting confusing. I'm outta here. Thanks for posting this!! 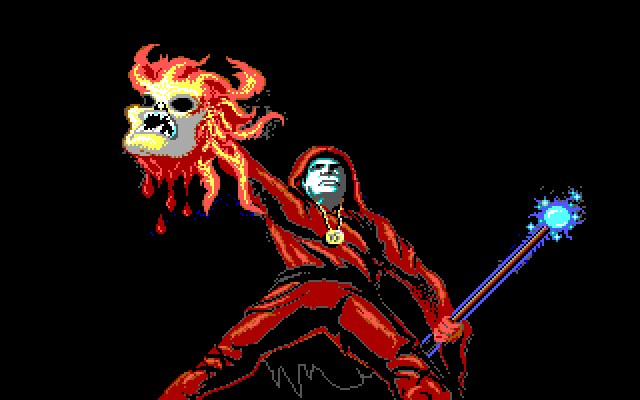 I'd mostly forgotten about Catacomb 3D--which I hadn't played since the early 90s--until stumbling across this post, but what a game. I actually really enjoyed it, as much as Wolf3d, if not a little more. I think I mostly liked the exploration aspect, which Wolf3d was a little lacking. 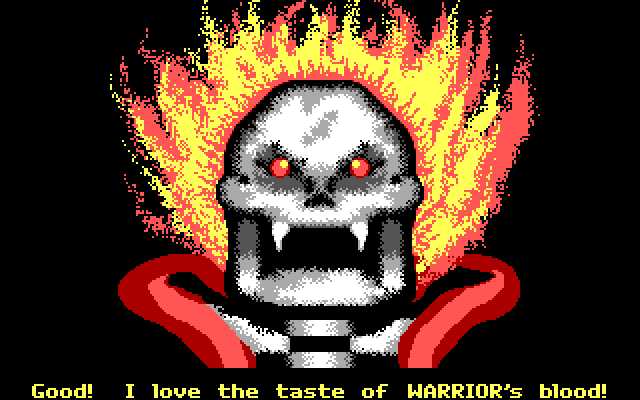 I've also written a little mini-review at 0x38 - http://0x38.com/151292_By_Platform/151295_DOS/152685_Catacomb_3D - and of course I had to go fire up Dosbox and try it again, and it is a little tedious having to pound the control key repeatedly, but oh well. Think I'll try and play through it this weekend all the same, just for kicks. 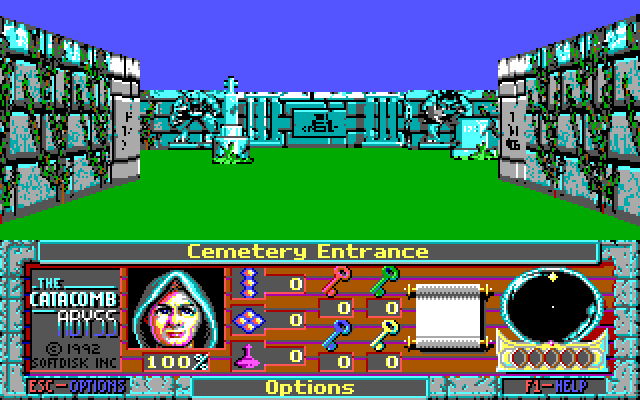 Catacomb 3D was released in November 1991 by Softdisk and was programmed by Carmack, Romero, Hall and Blochowiak with art by A. Carmack. 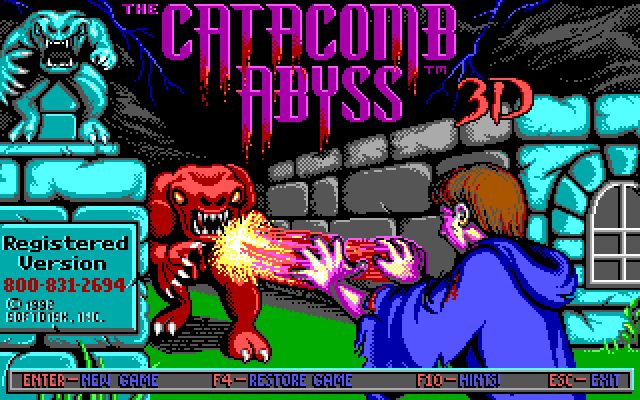 The Catacomb Abyss 3D was released in 1992 and was made by Softdisk *way after JC, JR, TH and AC had formed iD software (1991)*. Programming by Mike Maynard, Jim Row, and Nolan Martin. Art Direction by Steve Maines, Art Production by Steve Maines, Carol Ludden, Jerry Jones and Adrian Carmack. Quality Assurance by Jim Weiler and Judi Mangham. 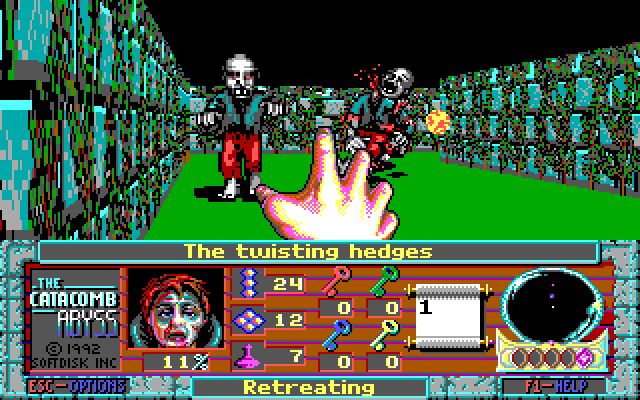 3D Imaging Effects by ID Software. Obviously iD were working on what would become "Wolfenstein tech" at that time, and TCA-3D uses "3D Imaging Effects" made by iD. General announcement: it's NEVER too late to point out any or all of mecha-neko's mistakes.